"One of the strongest signals of climate change in the Western Antarctic is the loss of sea ice, receding glaciers and the break-up of ice shelves," says Dr. Simon Morley, lead author, based at the British Antarctic Survey (BAS), UK. "Climate change will affect shallow water first, challenging the animals who live in this habitat in the very near future. While we show that many Antarctic marine species will benefit from the opening up of new areas of sea floor as habitat, those associated with sea ice are very much at risk." They found that krill—crustaceans whose young feed on the algae growing under sea ice—were scored as vulnerable, in turn impacting the animals that feed on them, such as the Adèlie and chinstrap penguins and the humpback whale. 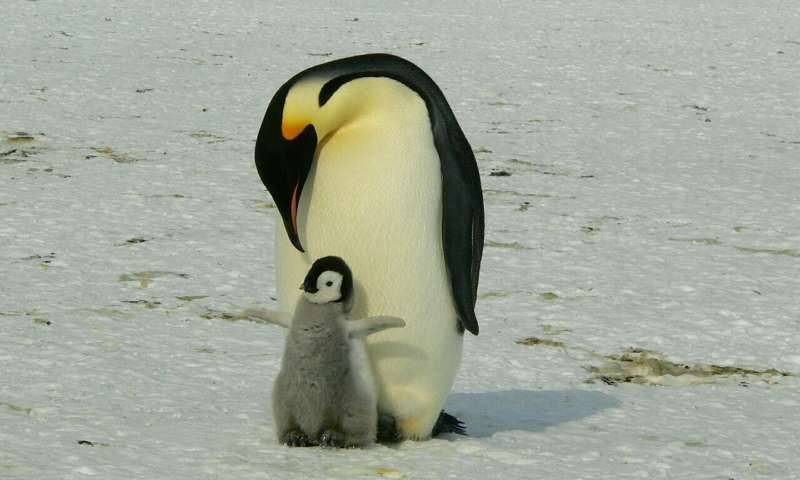 The emperor penguin scored as high risk because sea ice and ice shelves are its breeding habitat. "Many of these species are the more robust pioneers that have returned to the shallows after the end of the last glacial maximum, 20,000 years ago, when the ice-covered shelf started to melt and retreat," explains Dr. David Barnes, co-author of this research. "These pioneer species are likely to benefit from the opening of new habitats through loss of sea ice and the food this will provide." He continues, "Even if, as predicted for the next century, conditions in these shallow-water habitats change beyond the limits of these species, they can retreat to deeper water as they did during the last glacial maxima. However, these shallow-water communities will be altered dramatically—temperature-sensitive animals with calcium shells were scored as the most at risk if this happens."